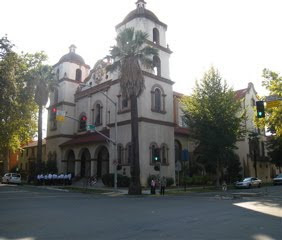 Our last performance at home (before Christmas) was in Sacramento on a 100 degree afternoon, in St. Francis of Assissi Church. Christmas may SEEM a long way off, but we're working on the program in our warm-ups. While our last two weeks in Northern California have been intense, nothing compares with our Christmas tour. We always look forward to it and love it, and it will be here before we know it! All you Bay Area people should get your tickets now! 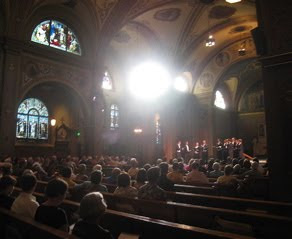 Unfortunately while we were doing this, somebody was kicking down the sacristy door (to our dressing room) and making away with six of our backpacks - rental car keys, house keys, wallets, phones, music, our egg shakers for the Mason Bates piece - and more, as you can imagine. If it had to happen, it was at least better that we were with one of our super-friendly home town (Bay Area) crowds, who spent a very long intermission while we assessed the scene, got mad, calmed down, and made some phone calls about credit cards. They gave us a consolatory standing ovation when we came back out - which really did help! Tomorrow we head out for Illinois, Indiana, Ohio, and New York State. 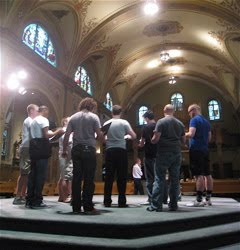 We will be having a Youth Choral Festival in Akron, Ohio - and of course we'll tell you how it all goes!